The main goal of Virtual Serial Port Driver by Eltima Software is creating virtual COM port pairs. Virtual serial ports created in VSPD behave as if they were real ports and are taken for the real ones with the serial applications. Via these ports serial applications can communicate with each other and transfer data via virtual null-modem cable. The data written to one virtual serial port can be instantly read from the other. Virtual serial ports created in VSPD support all serial port settings, strict baudrate emulation, HandFlow control and signal lines. After virtual COM port pair was created, one can see these ports in Device manager, moreover these ports are available automatically at system startup, even prior to logon. 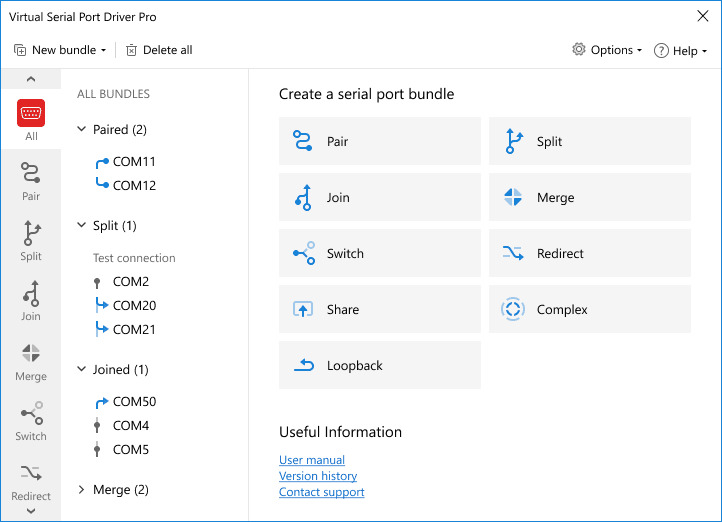 Virtual Serial Port Driver is available in a GUI version as well as a driver version with API for those who are going to use it in their own product.